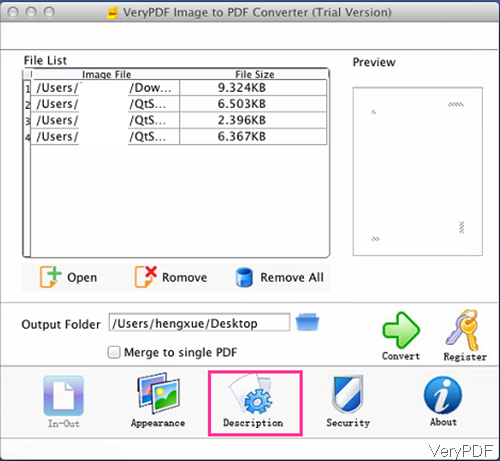 ← How to convert PDF to PDF/A and compress PDF under Mac system? In this article, I will show you how to convert image to PDF and add basic information like, title, keyword and others to output PDF in batch under Mac system. The software I use is VeryPDF Image to PDF Converter for Mac, which can help you create PDF from various image files like jpg, jpeg, bmp, gif, pbm, pcx, png, ppm, and tiff. Meanwhile, this software is GUI version, so it is extremely easy to use. Please check more information of this software on homepage. Now I will show you how to use this software. Please free download this software and install it to your computer. When downloading finishes, you will find a .pkg file, please install this software by double clicking the .pkg and following installation message. When installation finishes, please click Finder then go to Application, you can find this software start icon. The following snapshot is from the software interface, please have a check. 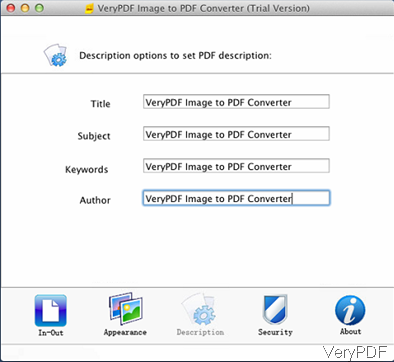 Secondly, convert image to PDF in batch and add basic information under Mac system. This software supports Mac versions of Mac OS X: v 10.5, 10.6, 10.7 and later, or else this software can not be installed. When launch this software, please click button Open to add image files which you need to convert to PDF file to software interface, All this software supports drag and drop adding software method. When adding finishes, added image files will be shown in the list with file path and file size. In the left Preview Window part, you can view PDF at random page. By this way, you will not mistake one with another. Click folder icon on the software interface to specify output folder. 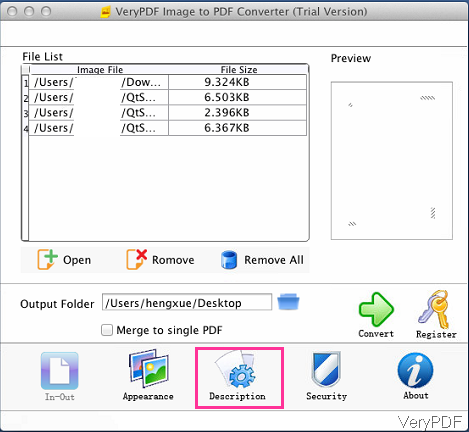 If you need to merge all image files into one PDF file, please click that option under folder. Then click button option Description you can add basic information to output PDF. The following snapshot is from the Description menu tab, please have a check. Here you can add title, subject, keywords and author to output PDF file. In the Appearance tab, you can control paper size and PDF resolution. In the Security tab, you can set password to protect output PDF file. When you finish setting part, please back to the main interface and click option Convert to run the conversion at once. A few seconds later, you can check output PDF file in specified output folder. By this software, you can convert image to PDF under Mac system easily. During the using, if you have any question, please contact us as soon as possible. How to extract image parts from PDF for making flipbook under Mac system? How to remove PDF password under Mac system in the easiest way? How to generate monochrome image from PCL by command line under Mac system? How to convert HTML to image and specify image resolution under Mac system? How to convert HTML to PDF by command line under Mac system? This entry was posted in Software for Mac and tagged image to PDF. Bookmark the permalink.